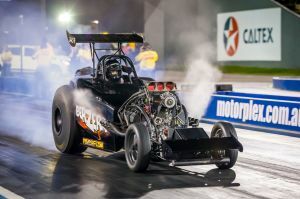 The post 20 TRACK RECORDS SET AT DRAG RACING GRAND FINALS appeared first on Perth Motorplex. 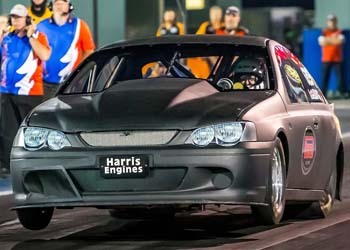 The post ONE DRIVER WILL MAKE SUPER SEDAN DREAM COME TRUE appeared first on Perth Motorplex. 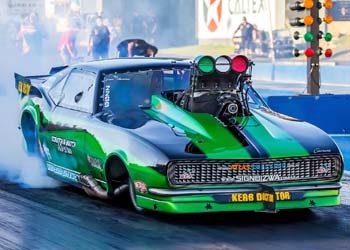 Don’t miss any of the Grand Final drag racing action this Saturday and Sunday. The post ZAPPIA TESTING NEW IDEAS IN SUMMER SLAM! appeared first on Perth Motorplex. 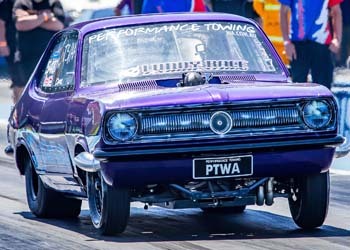 The post LOCAL DRAG RACERS HAVE PLENTY TO RACE FOR THIS WEEKEND appeared first on Perth Motorplex. The post WA TOP ALCOHOL ON THE RISE! appeared first on Perth Motorplex. Olive, driving the hot rod nicknamed ‘Psycho’, only just missed achieving the car’s first 5sec. pass with a best of 6.01sec. “It was a great day of racing for ‘Psycho’ and we were very consistent all day,” he said. “We did have a crack at running its first five but wasn’t meant be in Perth. Olive believes it will only be some minor adjustments to the car that see it take those precious few hundredths of a second off a pass. “I think it will happen. This car will run a five with a little more fine tuning and I really hope it happens at our next event in Sydney for the whole team. 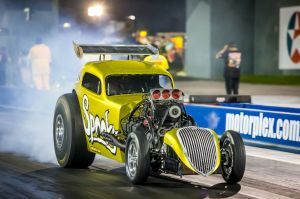 In other divisions, the Summer Slam Series continued to deliver excellent Top Doorslammer racing, with a new winner emerging at the conclusion of the event. Mark Chapman drove his Penrite Racing Plymouth Fury to a close 5.94sec. to 5.97sec. 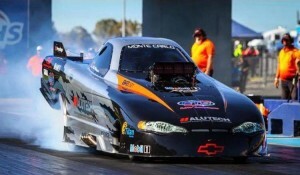 win against John Zappia, seizing the opportunity when Zappia’s supercharger backfired off the motor. Chapman’s win was spectacular with a broken wheelie bar dragging through the braking area, causing a trail of sparks behind. “Besides that and some new tyres which gave us some trouble in the first round everything went smoothly,” he said. In Modified, Nicholas Wroe was able to achieve redemption following a crash earlier in the season, taking out the win from Erin Healy. Wroe said the team had much work to do following the accident and were glad to put it back into the winner’s circle. “There was a bit of damage to both the car and my confidence,” he said. “The car was stripped over the following few days after the crash and we assessed it from then, figuring out what was straight, what needed fixing and what needed replacing. “A lot of work was done by Dad and I along with help from Geoff and Lauren from Black Magic Race Cars. It was an emotionally charged first ever win for Luke Seaton in Modified Bike, Luke’s Grandmother lost her battle with Cancer a few days before the race and he knew she would have wanted him to continue to do what he loves … Check out Luke’s Face Book post on his maiden win here. Other winners for the night included Russell Ladbrook in Top Comp, Errol Quartermaine in Super Comp, Ross Smith in Competition Bike, Alan Mahnkoph in Supercharged Outlaws, Chris Roe in Top Sportsman, Simon Travaglini in Outlaw Radial, Mick Fenton in Super Sedan, Luke Seaton in Modified Bike and Craig Caton in Super Street. 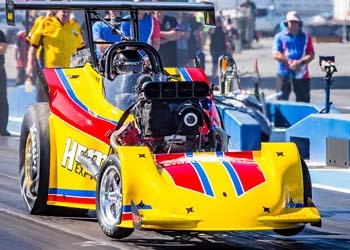 The final event for the WA drag racing season takes place on April 6 and 7 with the running of the ANDRA Summit Sportsman Series Grand Final. For more information and tickets head over to the Webpage Here! 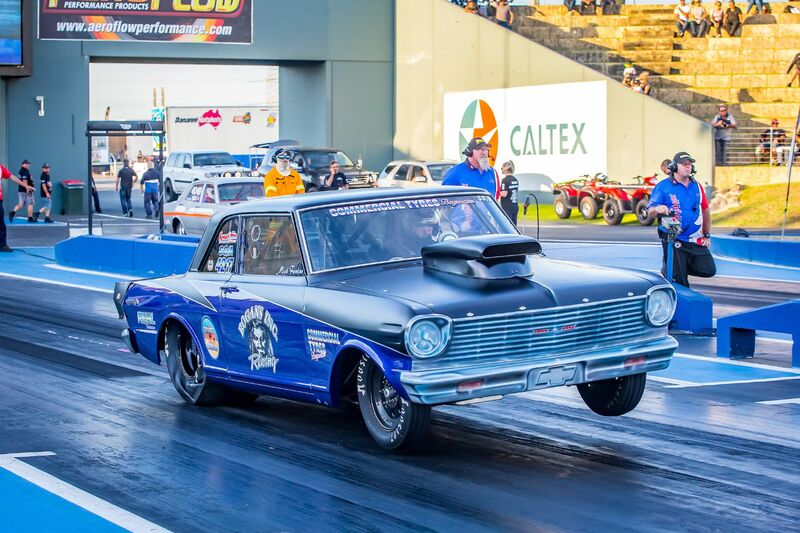 The post PSYCHO SUCCESS AT NITRO HEAVEN appeared first on Perth Motorplex. The recipe is near insanity. Take a 3000 horsepower, nitro burning motor from an Aeroflow Outlaw Funny Car, then put it into a hot rod with less wheelbase, less aerodynamics and less weight and see if the driver can control it! 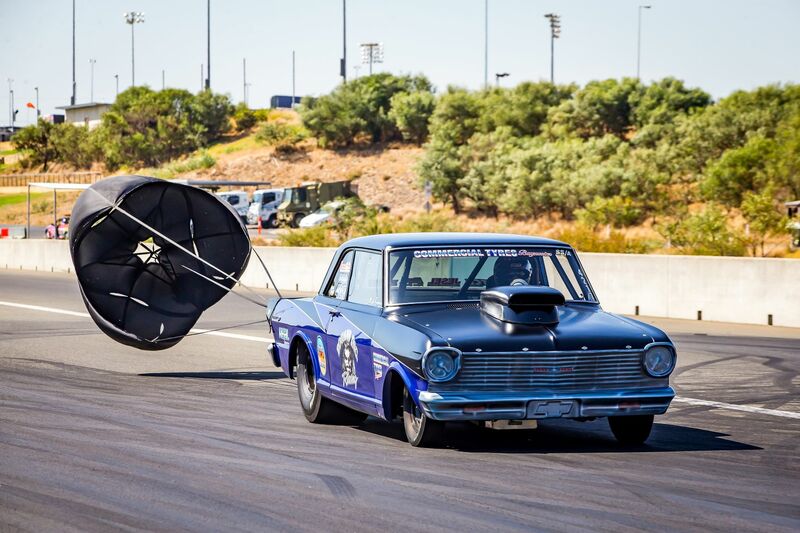 For Aeroflow series manager Morice Mcmillin, it’s all just part of just another day at work. 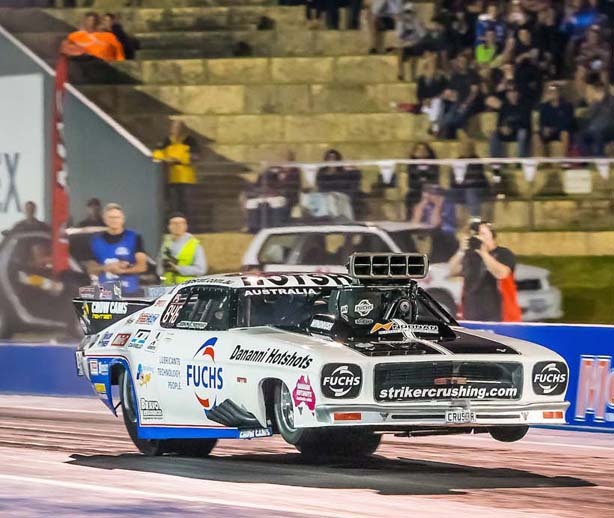 “It doesn’t seem to matter if it’s the Aeroflow Outlaw Nitro Funny cars or the Aeroflow Hot Rods, we get such a great response from the Perth public. We just love racing in the west,” he said. 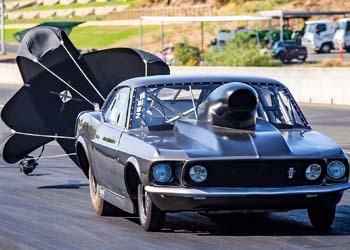 McMillin was the winner of last season’s inaugural Aeroflow Nitro Hot Rods event in Western Australia, winning a pedalfest final 6.33 to 6.40 against Rick Gauci. McMillin, who droves ‘Spooky’, said he would like to see a repeat of that luck. Keen for revenge however is Gauci, driver of ‘Chucky’s Toy’. If there is one thing the movie villain ‘Chucky’ is known for it is coming back time after time with a new plan. 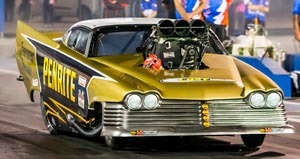 “’Chucky’s Toy’ is the most unpredictable drag car I have ever driven,” he said. “I swear this Nitro Hot Rod is possessed by ‘Chucky’ himself. Mcmillin let slip on a surprise for fans to come at the event, with a fresh Aeroflow Nitro Hot Rod coming along with the team. 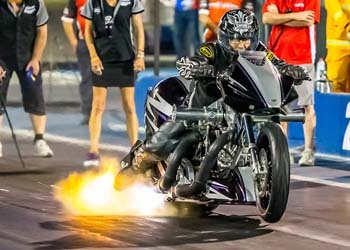 The Aeroflow Nitro Hot Rods will be supported by an entertaining program including the Summer Slam, where a full field of Top Doorslammers including John Zappia and Daniel Gregorini will battle it out, and Nitro Bike match racing between Jay Upton and Mark Drew. The Aeroflow Nitro Hot Rods might be based out of Sydney, some four days of driving away, but they say Perth Motorplex is like their home track. 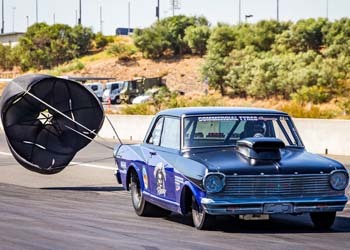 Every time they come to the Motorplex, one of the world’s premier drag racing venues, the show is spectacular and this weekend will be no different as four of the 3000 horsepower nitro burning Hot Rods coming to WA. 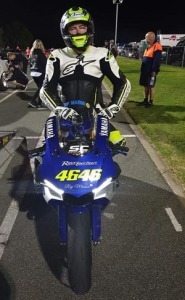 Queensland driver Justin Walshe said everything always seems to come together at the Motorplex. “Perth, nitro and good times seem to go hand in hand for all of us here at Aeroflow Outlaw Nitro Funny Cars and Hot Rods,” he said. “In a very strange kind of way it has almost become our home track.Which makes no sense when you consider all the drivers come from all over the country including Sydney, Queensland, Perth and we even have one of those Kiwi guys as well! “We love Perth fans and the venue is second to none, the offic ials know how to run an event and always look after the racers. The support categories are always great and the local racers put on one hell of a show. 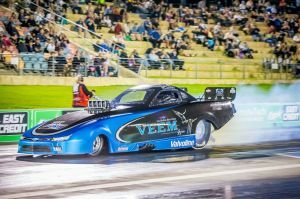 Walshe, who has driven a number of very quick cars throughout his drag racing career, will be steering ‘Berzerk’ and hopes to turn up a victory. Joining Walshe will be Shane Olive, who is also tasked with driving the truck containing the Aeroflow Nitro Hot Rods across the country. Olive drives the legendary ‘Psycho’ hot rod and wants to see a five second run from the car for the first time. “I can sum this little hot rod up with one word – it is truely ‘Psycho,’” he said. “We’re looking to run the car’s first five second pass. Sportsman qualifying begins from 11am with the Aeroflow Nitro Hot Rod feature program commencing from 5.30pm. Don’t miss out on any of the action this Saturday night, grab your tickets today! The post HOT ROD’S READY FOR ACTION! appeared first on Perth Motorplex. The Hottest Sprintcar Driver In Australia Right Now To Saddle Up In The Monte Motorsports #17 Sprintcar This Saturday Night. The race to be the winner in the second round of the AHG Easy As 123 Triple Crown just got that little bit harder with the late nomination of Jamie Veal. Photo - Breaking News: Due to inclement weather, today's The Cruzin NOSTALGIA's has been called off. Breaking News: Due to inclement weather, today's The Cruzin NOSTALGIA's has been called off. There will be no drag racing today. The event shall be rescheduled to a date early next season - with more information to come. After Night Thunder from the Motorplex on 7mate, we stay at the 'plex for Burnout King straight after. Smoke, Fire and Fury - SATURDAY! 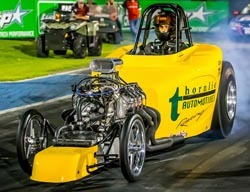 We are go with Mini Night at Formula Tech WhoopASS Wednesday on the drag strip with burnouts @ 9pm. 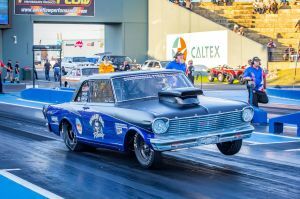 With The 2016 Cruzin NOSTALGIA's less than a week or so away, we thought we would recap on some of last year's NOSTALGIA's drag racing action courtesy of High Octane Photos. Qualifying on Sunday 17 April begins at 10am with Eliminations after 1:30pm. Warnambool, Victoria's Tim Van Ginnekin has taken out this years Wormall Civil Western Australian Sprintcar Championship in a tough affair over Jamie Maiolo and Daryl Clayden! Tonight we salute "The General" John Day for his commitment and services to Speedway in Western Australia with a huge night of racing! Congratulations to all our winners tonight on a tremendous evening of racing at the Maximum Thrust Grand Final, what was your favourite part? 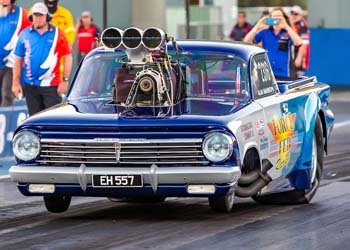 Video - Jet Drag Stars' USA import Chuck Haynes toasts the startline. Jet Drag Stars' USA import Chuck Haynes toasts the startline. 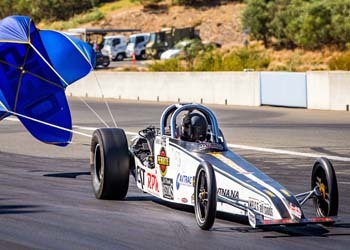 Frustration for Rhiannon Allison in the hit92.9 jet dragster at the Maximum Thrust Grand Final. Can you pick why she couldn't make this run (pretty easy to see)? Tonight the WA Drag Racing Family remember one of their own. 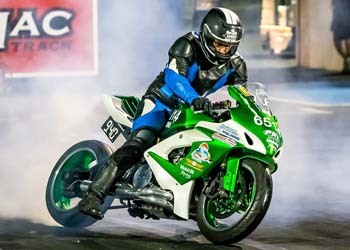 Simon Lekias - Passionate Drag Racer. He's an amputee, he's a cancer survivor and he rides a nitro fuelled Harley with a parachute to slow it down. Benny Stevens is the WILD MAN! Top Comp noises...mmmmm...we are rapidly closing in on the business end of the Maximum Thrust Grand Final. Just fill up at the 'jet fuel' bowser! The Jet Drag Stars are unloaded and ready to fire up for Maximum Thrust. Also, while you are in he puts, be sure to take a moment to remember Modified racer Simon Lekias, who passed away a fortnight ago. His dragster is parked opposite the jet tent. We will have a tribute in memory of Simon at 7pm tonight. Just fill up at the bowser! The Jet Drag Stars are unloaded and ready to fire up for Maximum Thrust. Also, while you are in he pits, be sure to take a moment to remember Modified racer Simon Lekias, who passed away a fortnight ago. His dragster is parked opposite the jet tent. We will have a tribute in memory of Simon at 7pm tonight. The Jet Drag Stars are on their way thanks to Nationwide Towing & Transport! Don't forget tonight is Kids Free, plus fireworks, Drift Xtreme show and of course our Track Championship finale with the supercharged stars of Top Comp featuring Pro Alcohol and wild Pro Slammers! On this date 16 years ago, the Chequered Flag fell for the last time at one of the longest running Speedway’s in the world. Claremont Speedway hosted many of the greatest riders and drivers that ever existed. Today the heritage of Claremont lives on through many of the faces you will see both on track, in the stands and around the Perth Motorplex. What are some of your memories of Claremont Speedway? Jet Dragsters - Fireworks - Drift Xtreme show - KIDS FREE! 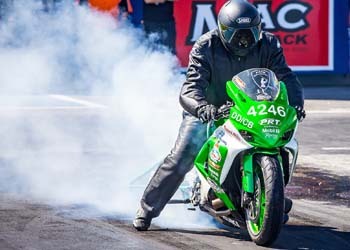 PLUS the supercharged stars of Top Comp including wild Pro Slammers and Pro Alcohol battle it out in the grand final of the WA Drag Racing Championship! 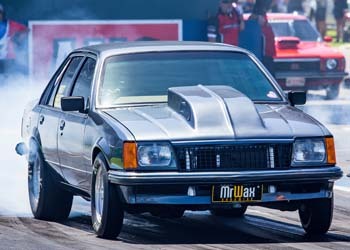 The Maximum Thrust Drag Racing Grand Final is this Saturday! Video - US muscle in action at Formula Tech WAW. Which one would you have? US muscle in action at Formula Tech WAW. Which one would you have?